And you found those bright landings Janice. BeautifuL. 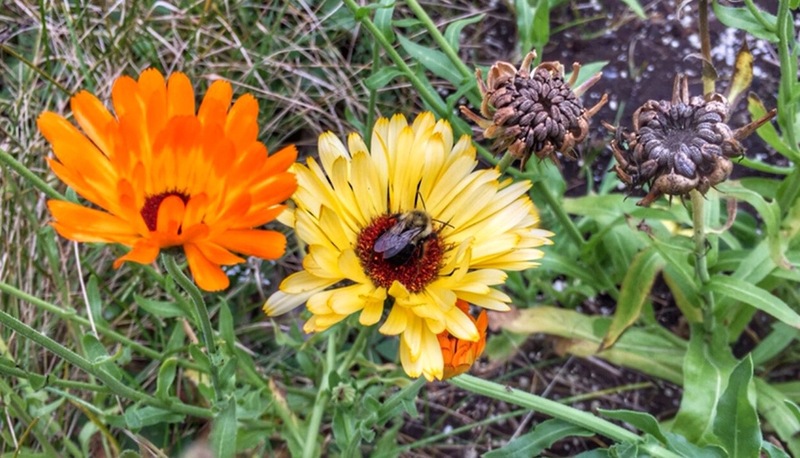 Yes I did….well I planted these calendula from saved seeds…and there are others around the garden that were seeded by nature. I love that there are (or were) still some blooming (we had a touch of frost last night so I am not sure what I’ll find outside today) Thanks Miriam. Love this! Those clenched seeds, and the hunger for brightness. I do like this one, Janice—’eyes like bees roaming’—gorgeous! The poetry has a lot of subtlety Janice lots to think about. beautiful flowers when controlled, if they escape into our bush they go crazy.